I N D E X T H E F E D E R A L R E S E R V E B A N K o f S T . L O U I S | C E N T R A L T O A M E R I C A ' S E C O N O M Y W I N T E R 2 0 1 5 - 2 0 1 6 8 Grassroots Neighborhood Revitalization in Hyde Park 6 9 Neighborhood "House Economy" Teaches Youth Life Lessons cdac spotlight Collaboration: The Key to Champion Community Investments' Success >> continued on Page 3 By Ray Boshara B ravo to MacKenzie. When she was born, she chose married, white, well-educated parents who live in an affluent, mostly white neighborhood with great public schools. She also chose her birth year wisely, making sure that she graduated from college and entered the job market when the economy was rebounding from the Great Recession. anks to the wealth and financial savvy of her parents, MacKenzie graduated from a private, four-year selective college debt-free, giving her many career options as well as the ability to start saving for a home and retirement. Because of her great "choices," MacKenzie is likely to accumulate wealth and achieve financial health over her lifetime. She and her parents belong to the roughly one in four American households we can call "thrivers." But too bad for Troy. Despite being just as bright as MacKenzie, he chose nonwhite parents who never married and live in a poor, highly segregated neighborhood with lousy public schools and few opportunities to be involved in music, sports and civic activities. Troy's young, hard-working, conscientious mother was never able to start college. In order to manage the frequent ups and downs in her financial life, she has accumulated debts to family members and credit cards. She also lacks the know-how and networks to get Troy on a college- bound track, something his school fails to do as well. And Troy unwisely chose to finish high school just as the Great Recession was getting underway. So, finding any job, let alone a decent- paying one with benefits, eludes him. Because of his bad "choices," Troy is not likely to accumulate much wealth or feel financially healthy over his lifetime. He and his family belong to the roughly three in four American households we can call "strugglers." Research from the Center for Household Financial Stability at the Federal Reserve Bank of St. Louis suggests that three demographic driv- ers—age/birth year, education and race/ethnicity—increasingly matter for building wealth and financial security. 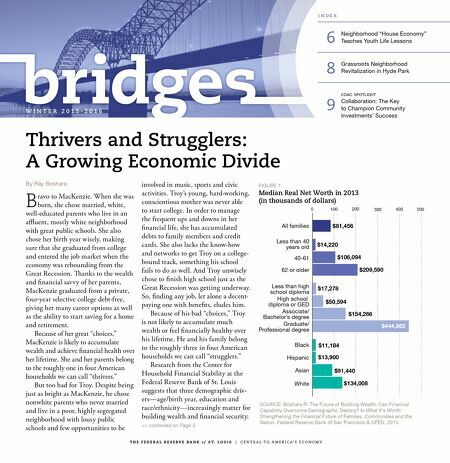 Thrivers and Strugglers: A Growing Economic Divide 100 $14,220 $81,456 $106,094 $209,590 $17,278 $50,594 $11,184 $13,900 $91,440 $134,008 0 200 500 400 300 All families Less than 40 years old 62 or older 40-61 Less than high school diploma High school diploma or GED Associcate/ Bachelor's degree Graduate/ Professional degree Black Hispanic Asian White $444,862 $154,266 FIGURE 1 Median Real Net Worth in 2013 (in thousands of dollars) SOURCE: Boshara R: The Future of Building Wealth: Can Financial Capability Overcome Demographic Destiny? In What It's Worth: Strengthening the Financial Future of Families, Communities and the Nation, Federal Reserve Bank of San Francisco & CFED, 2015.